"Filled with a mixture of spinach, feta cheese, and kalamata olives, marinated bison flank steak is roasted or grilled in this Greek-inspired preparation." For filling, heat the 2 teaspoons oil over medium heat in a large skillet. Cook the 2 cloves garlic in hot oil for 1 minute. Add spinach; cook and stir for 1 to 2 minutes or until spinach begins to wilt. Drain spinach in a colander, pressing out any excess liquid with the back of a spoon. Coarsely chop spinach. Stir in feta cheese and kalamata olives; set aside. Drain bison flank steak; discard marinade. Spread filling mixture evenly over bison flank steak to within 1 inch of edges. 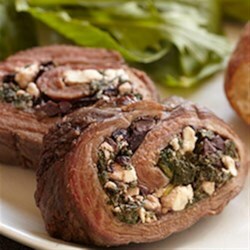 Starting from long edge, roll up bison flank steak into a spiral, making sure the ends stay tucked in. Using heavy 100-percent-cotton kitchen string, tie bison roll at 1-inch intervals. Place bison roll on a rack in a shallow roasting pan. Insert an oven-going meat thermometer into the center of the bison roll. Roast, uncovered, for 35 to 40 minutes or until internal temperature registers 135 degrees F. Cover with foil; let stand for 10 minutes before slicing. Slice bison roll into 3/4-inch-thick slices. Stuff full of goodies, bake and enjoy! To Grill: For charcoal grill, arrange preheated coals around a drip pan. Test for medium heat above pan. Insert a meat thermometer into the center of the bison roll. Place bison roll on grill rack over drip pan. Cover and grill for 35 to 40 minutes or until thermometer registers 135 degrees F. (For gas grill, preheat grill. Reduce heat to medium-high. Adjust for indirect grilling. Grill as above.) Cover with foil; let stand for 10 minutes before slicing. Note: Recipe developed and tested by the Better Homes and Gardens® Test Kitchen using High Plains Bison products.